Amelie's Blog : Mix & Match with Le Bunny Bleu Fashion Sneakers! Le Bunny Bleu brought you the sweetest shoes you've ever seen! A brand from new york, it has blended hipster cool New York fashion scene and the effortless European chic-ness. The unforgettable bunny mascot is all about the way you think -- desirable on freedom, going through life with determination, being both charming and fascinating, it's a desire that gets you where and what you want. Le Bunny Bleu signature range of shoes cover from classic to avant-garde, with over 100 styles including Oxfords, Slip-ons, Loafers, Espadrilles, Ballet flats, Sandals, Rain & Wool boots and fashion sneaker. As one-of-a kind with extreme comfort, you can be a hipster or a romance vintage chic. So before the fitting session, it's definitely eye-ing all the shoes in the stores like a happy girl. I would be just sharing some of my favorite shoes on each category. 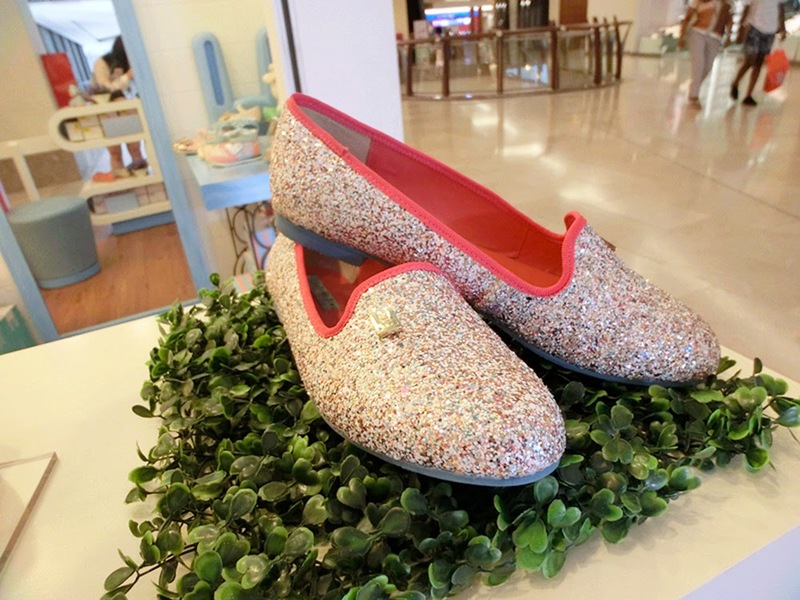 This pair of flats is so CHIO and bling that I can't have any words to describe it LOL. After wearing it, you will sure shine like a diamond, anytime and anywhere haha! These designs are way too adorable. Awww, it's actually sandals for kids, they have it as well for adults. Mom and daughters could definitely pair up with the same shoes! After all, it's fitting time. Eventually, after spending hours, I have brought home with my Gold Suzie Sneakers. I guess wearing this pair of fashion sneakers, I'll instantly become an attention seeker, like wearing 42K gold on my feet haha! Thanks to Le Bunny Bleu and #Butterflymsia! Well, I have to say that sneakers are absoulutely great in pairing any clothes or styles, yet giving us the most comfort. Don't you agree? To be honest, I used to wear slippers all the time but now I am having my fun time with Gold Suzie Sneakers! So, here are some tips on few styling paired with Le Bunny Bleu Gold Suzie Sneakers. Done with 4 different styles! How about you? Have you gotten yours yet? For more information and choices, please feel free to visit Le Bunny Bleu outlet or www.lebunnybleu.com.